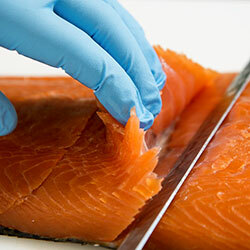 Driven by our passion for high quality food, Mare Nostrum is an established expert in the fish processing sector. Thanks to our competence and professionalism, we have been able to transform our passion for the Mediterranean tradition of fish processing into an entrepreneurial reality, capable of dealing with the most demanding demands of international markets. By focusing strongly on research and the use of high quality products, Mare Nostrum has also been able to quickly succeed abroad, reaching standards of absolute excellence internationally. Protection of health and respect for the environment are our core values. In order to guarantee the highest quality we are particularly strict in the choice of our products and production techniques. As a matter of fact, all the raw materials used in the process are of natural origin. To obtain products with a unique and a delicate taste, we only use the best food qualities, carefully selecting the raw materials and scrupulously checking the origin of each element. In every phase of the process,we cook every product, from smoked salmon to bottarga, scrupulously following our company’s strict quality procedures. Many of the processing steps that make our products special, such as salting or smoking, require a great deal of experience. Thanks to the competence of our staff, it is possible to give our products unique nuances of flavor. The constant search for quality is our main goal, especially during all the production cycles, from the research of the raw materials to the strict controls during the fish processing. Our attention and our passion for high quality food allow us to offer extremely tasty and genuine products. All Mare Nostrum’s specialities are characterized by their unique goodness and their naturalness and authenticity. We only use the best raw materials. We scrupulously and attentively check their origin. All Mare Nostrum’s specialties are distinguished by their unique goodness and the naturalness of their products. We put social values ​​such as protection of health and respect for the environment first.